They’ll still taste the same, but some of the world’s most famous oysters will have a new name when the 2015 season begins on March 1. 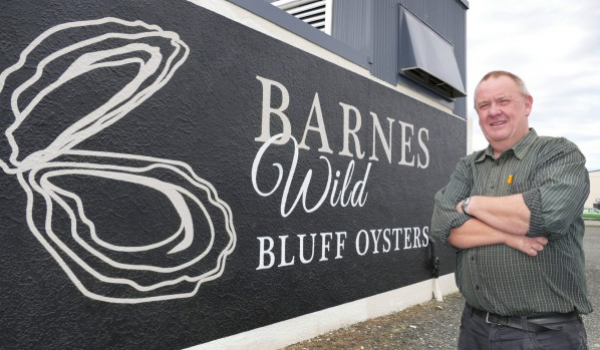 Barnes Oysters has been rebranded Barnes Wild Bluff Oysters as the company looks to differentiate its product from the growing number of farmed oysters being sold throughout New Zealand. General manager Graeme Wright said after 57 years the Barnes brand was one most Southlanders had grown up with, and the time was right to present a more modern image. Along with a new logo, the company had recently launched its website and would be rollng out new black and gold packaging this season, he said. “It’s more than just another product; it’s an icon really. Placing more emphasis on ‘`wild” oysters would give the company a strong point of difference, he said. “To me it’s like farm-fresh eggs versus battery hen eggs. Wright said the company had eight vessels in its fleet, each harvesting up to 1 million oysters per season. A decision on the 2015 harvest level would be made early in the season, once the results of recent survey work were known, he said. The results were expected within a month but the early signs were positive, he said. Part of the survey looked at the presence of bonamia, a shellfish parasite that wiped out more than 1.5 billion oysters - about 95 per cent of the total population - in 2001/2002. The population had recovered but between 10 and 20 per cent of oysters in Foveaux Strait were still killed by bonamia every year, he said. A new form of DNA technology had recently been developed to help detect the parasite and would hopefully drive that number down, he said. “Scientists used to believe bonamia would just leave the fishery but the reality is that it lives there all the time. “No one understands yet what drives it, but we know it’s there so for us it’s about detecting it and trying to manage it so we’ve got a sustainable fishery into the future.